Versions allow you to build and publish different models. A good practice is to clone the current active model to a different version of the app before making changes to the model. To work with versions, open your app by selecting its name on My Apps page, and then select Manage in the top bar, then select Versions in the left navigation. The list of versions shows which versions are published, where they are published, and which version is currently active. Select the version you want to clone then select Clone from the toolbar. In the Clone version dialog box, type a name for the new version such as "0.2". Version ID can consist only of characters, digits or '.' and cannot be longer than 10 characters. A new version with the specified name is created and set as the active version. Select a version from the list, then select Make Active from the toolbar. Select Import version from the toolbar. In the Import new version pop-up window, enter the new ten character version name. You only need to set a version ID if the version in the JSON file already exists in the app. Once you import a version, the new version becomes the active version. Tokenizer errors: If you get a tokenizer error when importing, you are trying to import a version that uses a different tokenizer than the app currently uses. To fix this, see Migrating between tokenizer versions. To delete a version, select a version from the list, then select Delete from the toolbar. Select Ok.
To rename a version, select a version from the list, then select Rename from the toolbar. Enter new name and select Done. 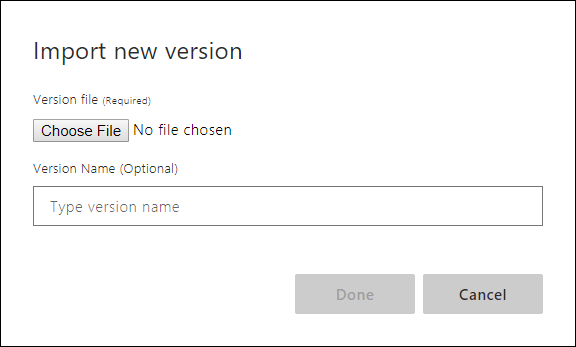 To export a version, select a version from the list, then select Export app from the toolbar. Choose JSON to export for backup, choose Export for container to use this app in a LUIS container.